A man counts his 100-bolivar notes next to a sign alerting customers with a message in Spanish that reads: ”100-bolivar notes will only be received until Tuesday, 12-13-16,” inside a bakery in downtown Caracas, Venezuela, Dec. 12, 2016. President Nicolas Maduro on Monday ordered the closure of Venezuela's border with Colombia for 72 hours in a crackdown on what he says are "mafias'' smuggling hard-to-find cash that is destabilizing the socialist economy. The move comes as Maduro is trying to get a grip on Venezuela's galloping inflation, which has choked business and made bolivar notes among the hardest items to find in the already shortage-plagued oil-based economy. The border shutdown coincides with Maduro's decision to withdraw from circulation the 100-bolivar note, which is currently the country's largest-denominated bill but worth only about 3 U.S. cents at the widely used black market rate. The government says it will start replacing the 100-bolivar note with larger bills. People line up to withdraw cash from an automated teller machine outside a Banco Provincial branch in Caracas, Venezuela, Dec. 12, 2016. Venezuelans on Monday rushed to spend their 100-bolivar notes before a Wednesday deadline for the bill to be taken out of circulation. 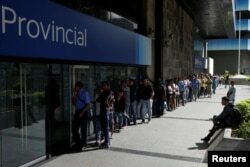 An estimated one-third of Venezuelans have no bank account and keep their savings in the soon-to-be-worthless bills. In the coming days, the country is expected to roll out six larger-denominated bills reaching as high as 20,000 bolivars. Many economists say the larger bills will fuel only faster inflation, which is already the highest in the world and forecast by the International Monetary Fund to soar past 1,000 percent in 2017. Maduro has long accused criminal gangs operating along the border of trying to smuggle everything from truckloads of subsidized food to gasoline sold in Venezuela at the world's cheapest prices. He compared the trade in cash to something like a centrifuge by which "mafias'' operating from the Colombian border city of Cucuta buy scarce bolivars with hard currency and then recycle them back into Venezuela for a huge profit, driving down the currency's value in the process. He said that earlier Monday 64 million bolivars in cash had been seized coming across the border on dirt trails that proliferate along the 1,378-mile (2,219-kilometer) border. There was no immediate comment by Colombia's government. President Juan Manuel Santos and his top aides are visiting several European capitals after the Colombian leader over the weekend received the Nobel Peace Prize in Oslo. The border between the two countries was closed for a year in a Venezuelan effort to combat smuggling. It was reopened in August to allow the few Venezuelans who can still afford it to cross into Colombia to buy badly needed food and medicine. In closing the border again, Maduro tried to sound conciliatory to Santos, saying the two had discussed the issue previously. He also seemed to acknowledge the seriousness of Venezuela's cash crunch by announcing a series of measures to stimulate electronic-based transactions.